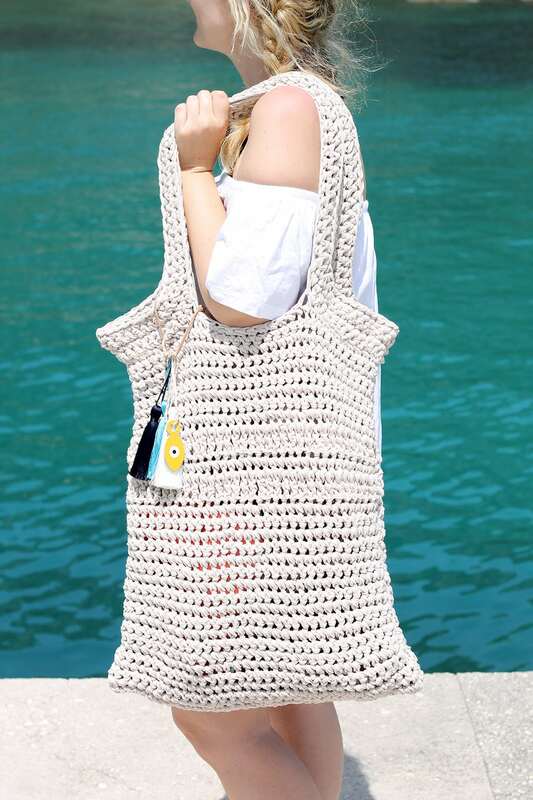 This HUGE crochet bag is just what you need for a day trip to the beach! This bag is the perfect size for holding all of your beach day essentials, pack up your beach towel, your sunscreen, and your current book and get ready for a relaxing day out. This simple crochet bag pattern was inspired by the images below I saw on Pinterest that were trending one day under the title of ‘Greek Aesthetic’. I felt inspired by all of them as I live on the small Greek island of Corfu, where every day I am surrounded by ancient architecture, lush green landscapes and the ocean. I wanted to make and share a crochet bag pattern that is really easy for any beginner crocheters, this pattern uses basic techniques, including; single crochet and treble crochet. I made the bag using Lion Brand Fast Track yarn in the colour ‘Truckers Taupe’ (122) a light beige colour perfect for summer. I also added a little decoration to hang from one of the straps in the ‘Greek style’ of blue and white, with a ‘bad eye’ charm for good luck. This crochet beach bag is an excellent beginner crochet project, that will introduce you to creating a chain, single crochet and treble crochet. You start with a simple chain, then single crochet into every stitch, with two rows of treble crochet thrown in. It’s really that easy! I have a video tutorial page for basic crochet stitches to help you if you need it. 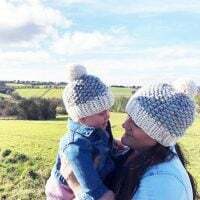 If you need help with any of the instructions in the pattern, please visit my ‘learn how to crochet’ page, which has video tutorials to help you. Continue to SC every row until the piece measures 17″ from the 1st row (the start of the work). Leave your last loop open – don’t cut it, as you will start to build the bag handles next. Place stitch markers where you want the bag handles to go. I placed them 6″ from the outside edge which left a 6″ gap in the middle section. Continue to SC into every stitch until you reach the first stitch marker, then ch 40 for the bag handle and rejoin the end of the chain into the first stitch where the second stitch marker is placed. Then continue to SC to the end of the row. Continue to SC every row for 3 rows / until the handles measure = 1.5″ width. Then do the same thing to the other side of the bag. The decoration – I added 3 thread tassels in dark blue, light blue and white to the side of the bag for some colour on a piece of leather. I also added a ‘bad eye’ charm for good luck! You can add whatever you want here, pom poms, key rings, large tassels etc. I found the tassels and charm in a local craft store (If you have ever been to Corfu – the one in San Rocco that sells all of the amazing jewellery making stuff and art supplies). 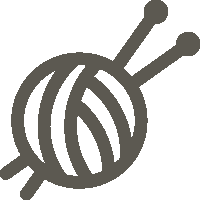 Could you please suggest alternative yarn?